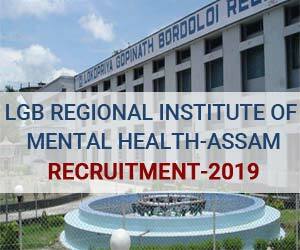 New Delhi: The Lokopriya Gopinath Bordoloi Regional Institute of Mental Health, Assam (LGBRIMH Assam) has released 23 vacancies for the posts of Professor, Assistant Professor, Associate Professor, Medical Superintendent, Deputy Medical Superintendent and Assistant Medical Superintendent. The eligible candidates can send their application on or before 08 April 2019. Applications on prescribed format are invited from the citizens of India for filling up the following posts by direct recruitment /deputation/re-employment basis as specified below so as to reach by 08.04.2019. Those who have applied in response to the Advt. No.LGB/Estt/246/01/Part-III/5540 dated 15.11.2017 and No. LGB/Estt/246/01/Part-III/3309 dated 10. 08.2018 need not submit formal application. But they will be required to submit willingness along with updated BIO-DATA without prescribed fee. Last Date to apply: 08-04-2019. The vacancies are in the Department of Radiology, Neurology, Psychiatry, Radiology, Neurology, Biochemistry/-Neurochemistry, Pathology, Hospital (Deputation or re-employment or contract), Hospital, Hospital, Clinical Psychology, PSW, Clinical Psychology, Psychiatric Nursing, PSW, Clinical Psychology, Psychiatric Nursing. Essential Qualification For Professor, Assistant Professor and Associate Professor: (i) A recognized MBBS degree qualification included in the First or Second Schedule or Part-II or the Third Schedule (other than licentiate qualifications) to the Indian Medical Council Act, 1956(102 of 1956). Holders of educational qualifications included in Part-II of the Third Schedule should also fulfill the conditions specified in sub-section (3) of section 13 of the Indian Medical Council Act, 1956(102 of 1956). (ii) Post-graduate degree in the concerned speciality or Super speciality mentioned in Section –A Schedule-VI or equivalent recognized DNB qualification awarded by National Board of Examination. Essential Experience for Associate Professor (Super Speciality): At least 05 years experience as Senior Resident / Tutor / Demonstrator / Registrar / Lecturer in the concerned speciality in a recognized teaching institution, after the first Post-graduate qualification. Note: In the case of holders of D.M. / M.Ch. qualification of 05 years duration, the period of Senior PG residency rendered in the last part of the said D.M. / M.Ch shall be counted towards requirement of five years experience. Essential Experience for Associate Professor (other than Super Speciality): (i) At least 05 years experience in the concerned specialty as Tutor /Demonstrator / Senior Resident / Registrar / Lecturer in a recognized teaching institution, after the requisite Post-graduate degree qualification out of which at least 2 years shall be as an Assistant Professor. Note 1: Teaching experience in any other post like the post of General Duty Medical Officer/Medical Officer shall not be considered for eligibility purpose for recruitment to teaching posts. Desirable: Minimum of 4 Research Publications indexed in index Medicus or National journals. Essential Experience for Assistant Professor: (i) At least 03 years teaching experience in the concerned speciality as Lecturer/Tutor/Registrar/Demonstrator/Senior Resident after the requisite post graduate degree qualification. Note 2: For Associate Professor Desirable: Minimum of 4 Research Publications indexed in index Medicus or National journals. ABBREVIATIONS: S=Sitting, SE=Seeing, ST=Standing, MF=Manipulation by Fingers, KC=Kneeling and Crouching, C=Communication. Note: 5 – A person who wants to avail benefit of reservation would have to submit a Disability Certificate issued by a competent authority in format given in Annexure – I. Pay Scale: Rs.15,600-39,100 + AGP 7,000+ NPA. Essential Qualification For Medical Superintendent: (i) A Medical qualification included in the I or II Schedule or Part II of the third Schedule to the Indian Medical Council Act of 1956 (persons possessing qualifications included in part II or third schedule) should also fulfill the conditions specified in Section 13 (3) of the Act. (ii) A Postgraduate qualification, e.g. MD or MS or a recognized qualification equivalent thereto And / or Masters in Hospital Administration or a Post Graduate Degree recognized as equivalent to Masters in Hospital Administration by the Medical Council of India. Desirable: PG degree holder in Psychiatry. Experience: 10 years experience in Hospital Administration, preferably in a hospital with 300 beds, after obtaining the P.G. Degree in a senior position. Pay Scale: Rs.37,400-67,000 + GP 8,700 + NPA. Desirable: PG degree holder in Psychiatry. Experience: 5 years experience in Hospital Administration of a Hospital with at least 300 beds after obtaining the P.G. Degree in a senior position. (i) Experience in Hospital Administration. (ii) PG degee holder in Psychiatry. Essential Experience: 3 years experience in the specialty after PG Degree. The application in prescribed format is to be accompanied with a Bank Draft of Rs. 100/- to be drawn in favour of the Director, LGBRIMH, Tezpur and attested copies of all certificates/one PP size photograph so as to reach to the Administrative Officer, LGBRIMH, Tezpur- 784001 latest by 08.04.2019.